Important: I am no longer updating this comparison page. More info on the reasons can be found here. Thanks! This page includes a comparison of the various virtual infrastrcuture solutions available today for the x86 platform. If you have any feedback please send me an e-mail. How do I read these Overall Positioning figures? There are 6 key players it20.info is monitoring in this market. We have decided to not list non-hardware virtualization solutions (such as OS virtualization solutions) so the list doesn't include products like Virtuozzo or Solaris Containers. Since both Sun and VirtualIron has been acquired by Oracle we only list the latter. While this overview includes both RedHat and Novell we have decided not to track these two vendors in the tables below due to limited interest of the industry as well as a weak strategy/execution on their part (which makes collecting information a real challenge). How do I read these Market Positioning figures? This is a high-level market positioning of the various offerings available in the market. It's obviously subjective (clearly not objective). It's our own feeling of where most of the attention is (as of today). The feeling reported relates to the virtualization offering of the vendor. For example most independent hardware vendors (IHVs) are highly interested in RedHat / Novell Enterprise Linux distributions but the same IHVs might have limited interest in the RH/Novell virtualization strategy. How do I read these Hypervisor Characteristics figures? This is a somewhat detailed list of the hypervisor features for each of the vendors. LDAP Integration r r ? ? How do I read these Management Characteristics figures? This is a list of the features provided by the management products for each of the vendors. Most vendors tend to manage their own hypervisors but there are exceptions to this rule as you can see. 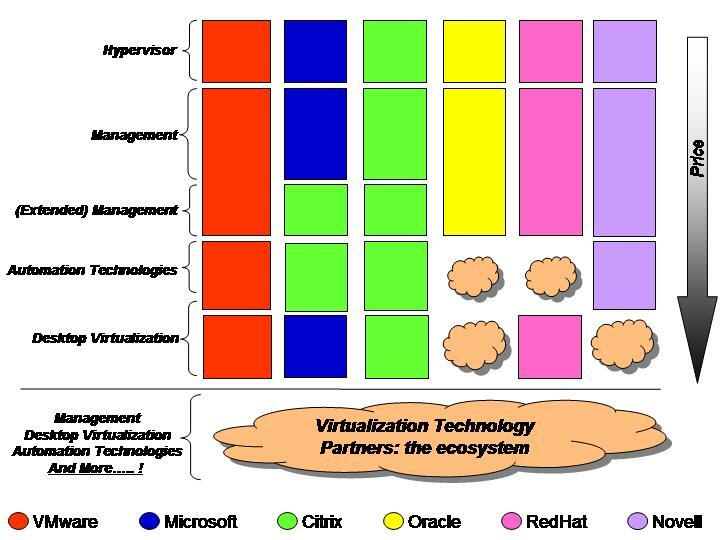 For some vendors (Oracle and Citrix namely) it is difficult to draw a clear line between the hypervisor and the managent product (this is true from a naming convention perspective as well as from a price perspective). How do I read these (Extended) Management Characteristics figures? This is naturally a continuation of the table "Management Characteristics". We created this artefact to accomodate the Citrix products layout that, at some level of the management stack, they fork their value proprosition from a price perspective (i.e. the Citrix "Management Characteristics" are free of charge as of today whereas the "(Extended) Management Characteristics" are a fee-based product) as well as from a platform support perspective (i.e.i.e. the Citrix "Management Characteristics" are only available for the XenServer product whereas the "(Extended) Management Characteristics" are available for both XenServer and the MS Virtualization stack). For other vendors (namely VMware, Microsoft and Oracle) the "Management Characteristics" table and the "(Extended) Management Characteristics" table are more like a continuum as far as product packaging and pricing are concerned. How do I read these Automation Technologies figures? This table is a bit different compared to the others. The other tables take into account a given product and explode its features set. This table lists a number of Automation technologies and details whether or not each of the vendors have a vertical product in their portfolio that maps that technology. A table for each of these technologies/products that explodes and compares the features set should be created but this is beyond the scope of this comparison effort at the moment. VDI Clients on Citrix XenServer r r a a r ? LDAP support r r r a r ? Client device location awareness r r ? a a ? How do I read these Desktop Virtualization figures? Oracle does not have an offering in this space so it's not listed in the table. We have decided however to track three vendors that belong to the ecosystem galaxy that have been historically very active in VDI architectures. VDI is sometimes alternative and sometimes complementary to standard Terminal Services deployments. Interestingly most vendors active in the VDI space (namely VMware, Leostream and Provision Networks) have extended their products to manage Terminal Services on top of VDI. Similarly vendors active in the Terminal Services space (namely Microsoft and Citrix) have extended - or are in the process of extending - their products to manage VDI on top of Terminal Services.